Wouldn't it be great to have a second set of eyes looking for the perfect job for you? That's exactly what a recruiter can do -- if you've got the right background and credentials. The most important fact to remember about recruiters is that you don't sign their paychecks -- employers do. Their first loyalty has to be to the employers who hire them to find job candidates. But recruiters do need a constant supply of job candidates to fill slots for their clients. When the match is there, both the recruiter and the job hunter win: The recruiter makes a successful placement, and you have a new job. Go National or Go Local? Directories such as Job Seekers Guide to Wall Street Recruiters, which list recruiters by specialties such as insurance and financial services, can be good starting points for finding the right recruiter. You'll also need to decide whether you want to work with a local or national recruiter. Typically, job seekers earning $50,000 to $75,000 or less annually go with local recruiters, while those who earn more work with national recruiters. Even if you're an entry-level candidate, there's probably a recruiter who focuses on your work. Amy Bouchillon of Alluvion Staffing in Jacksonville, Florida, caters to companies that need call-center staff, including collectors and loan processors. "We have a ton of leads on companies that are looking for part-time and full-time people," she says. If you're in a very specialized field such as mortgage servicing, check the classifieds of trade publications to find the names of recruiters who work your niche. The best way to find a great recruiter is to ask your friends in the business about the people they've worked with in the past. Once you have a short list of recruiters whose client lists match your needs, it's time to go fishing. Send each recruiter a short note about your background and a copy of your resume. If you've been referred by a friend, call the recruiter before you send the note and resume, suggests Paul Bees, recruiting manager for Robert Half International in Minneapolis. If the recruiter thinks you're a good candidate, he'll do a brief phone screen to see if your background fits the positions he's trying to fill. If you pass the phone interview, you'll be called in for a more complete screening. As you talk with recruiters, be specific about your career goals, where you'd like to be in three to five years and the type of corporate culture in which you're most comfortable. A recruiter doesn't want to send a casual type to a button-down employer. Be completely honest about your background and experience. 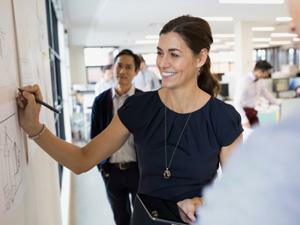 "It's important not to oversell or undersell your abilities," says Kay Cowling, senior vice president for Accounting Principals in Jacksonville, Florida. If you've worked at a bank for six years, and your office was next to the mortgage department, don't lie and say you can originate loans. Be truthful, and say you've been exposed to the work and believe you can do it. As you're sorting through recruiters, be sure to check their references. And ask the recruiter fairly specific questions: What's your expertise in your field? How long have you been in the business? How many placements do you do each year? Why should I work with you? Even if you've found the perfect recruiter, keep looking for a job on your own. Recruiters don't exist to find you a job; they exist to fill jobs. They may tell you you're perfect for a slot while trying to place 10 other candidates in the same position. Once you do find a new job, keep in touch with your favorite recruiters. Be a source of leads to them by passing along the names of folks you think might be interested in jobs they have to fill. After all, life is a two-way street. The recruiter you help today may be the recruiter who helps you tomorrow.